The 2018 FIFA World Cup starts in Russia from Thursday. Russia, which will host the World Cup for the first time, has different time zones. The matches will be played across four time zones. 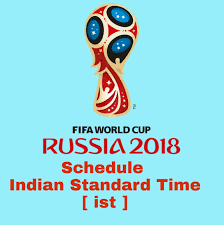 Here's the full schedule and kick-off timings in Indian Standard Time (IST) for all the group stage matches between June 14 and June 28. Russia vs Saudi Arabia - 8.30 p.m.
Egypt vs Uruguay - 5.30 p.m.
Morocco vs Iran - 8.30 p.m.
Portugal vs Spain - 11.30 p.m.
France vs Australia - 3.30 p.m.
Argentina vs Iceland - 6.30 p.m.
Peru vs Denmark - 9.30 p.m.
Costa Rica vs Serbia - 5.30 p.m.
Germany vs Mexico - 8.30 p.m.
Brazil vs Switzerland - 11.30 p.m.
Sweden vs Korea Republic - 5.30 p.m.
Belgium vs Panama - 8.30 p.m.
Tunisia vs England - 11.30 p.m.
Colombia vs Japan - 5.30 p.m.
Poland vs Senegal - 8.30 p.m.
Russia vs Egypt - 11.30 p.m.
Portugal vs Morocco - 5.30 p.m.
Uruguay vs Saudi Arabia - 8.30 p.m.
Iran vs Spain - 11.30 p.m.
Denmark vs Australia - 5:30 p.m.
France vs Peru - 8:30 p.m.
Argentina vs Croatia - 11:30 p.m.
Brazil vs Costa Rica - 5:30 p.m.
Nigeria vs Iceland - 8:30 p.m.
Switzerland vs Serbia - 11:30 p.m.
Belgium vs Tunisia - 5:30 p.m.
Korea Republic vs Mexico - 8:30 p.m.
Germany vs Sweden - 11:30 p.m.
England vs Panama - 5:30 p.m.
Japan vs Senegal - 8:30 p.m.
Poland vs Colombia - 11:30 p.m.
Uruguay vs Russia - 7:30 p.m.
Saudi Arabia vs Egypt - 7:30 p.m.
Spain vs Morocco - 11:30 p.m.
Iran vs Portugal - 11:30 p.m.
Australia vs Peru - 7:30 p.m.
Denmark vs France - 7:30 p.m.
Nigeria vs Argentina - 11:30 p.m.
Iceland vs Croatia - 11:30 p.m.
Korea Republic vs Germany - 7:30 p.m.
Mexico vs Sweden - 7:30 p.m.
Serbia vs Brazil - 11:30 p.m.
Switzerland vs Costa Rica - 11:30 p.m.
Japan vs Poland - 7:30 p.m.
Senegal vs Colombia - 7:30 p.m.
Panama vs Tunisia - 11:30 p.m.
England vs Belgium - 11:30 p.m.